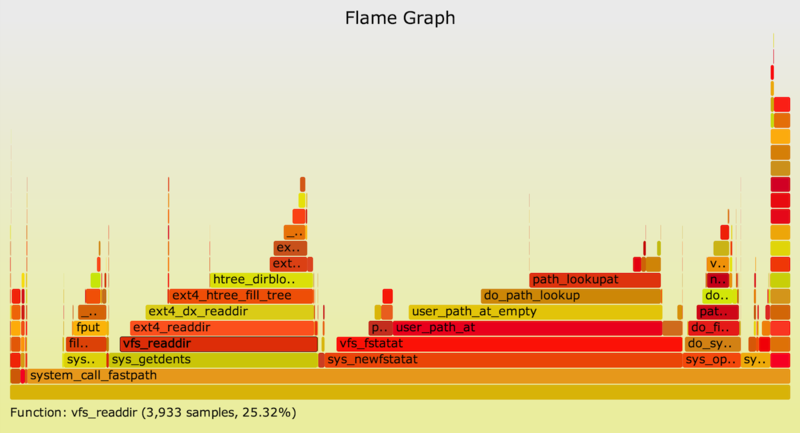 These are some example one-liners and scripts for ktap: a script-based dynamic tracing tool for Linux. This is not an official ktap page, but rather my own collection of tools I'm using. These examples were written on Ubuntu precise (12.04.2 LTS). Note: The ktap project stalled pending kernel integration and eBPF support, and has so far not continued. This page was last updated in 2014 and may not be updated again, so I've moved it to my Crypt. See my eBPF page for new developments in Linux tracing. WARNING: This is open source software for an in-development tool, which may not yet be safe for production use. Use at your own risk. I'm currently using this in my own lab environment, just like I do with other unstable Linux tracers. There's not a lot to see here yet... These examples will stop working from time to time as ktap evolves. Check the examples that come with ktap, which are kept more up to date as the code changes. I've included an example that has some starting text, so that you know when tracing has began. Instead of this, you could run these one-liners with "-v", verbose mode, for a similar effect. ktap's startup is fairly fast, so this is less necessary than it is with other tracing tools. syslatl.kp: syscall latency as a linear aggregation. This script can be edited to adjust the step size, which is 10 ms by default. UPDATE: this is now part of ktap, under samples/syscalls/syslatl.kp. Tracing syscalls... Hit Ctrl-C to end. The script loops from zero latency to the maximum seen, printing the counts for each latency range. As ktap is in development, it's possible an easier way to achieve similar output will be added. opensnoop.kp: trace open() syscalls and print basic details. Useful for debugging as it can quickly show which data files, log files, and config files are in use by an application. The sed(1) command remove tab characters (that's a tab, not a series of spaces), so that stackcollapse.pl can process the text. A stackcollapse-ktap.pl could be easily written to process ktap output directly, and avoid the need for sed(1). Click for the interactive SVG, where you can mouse-over elements. Took 5 minutes. As said earlier, this is still in development, so I'm only using it in lab environments at the moment.